In the 1910s, American motorcycles were built for long-distance touring, and Harley Davidson and Indian captured the public imagination. 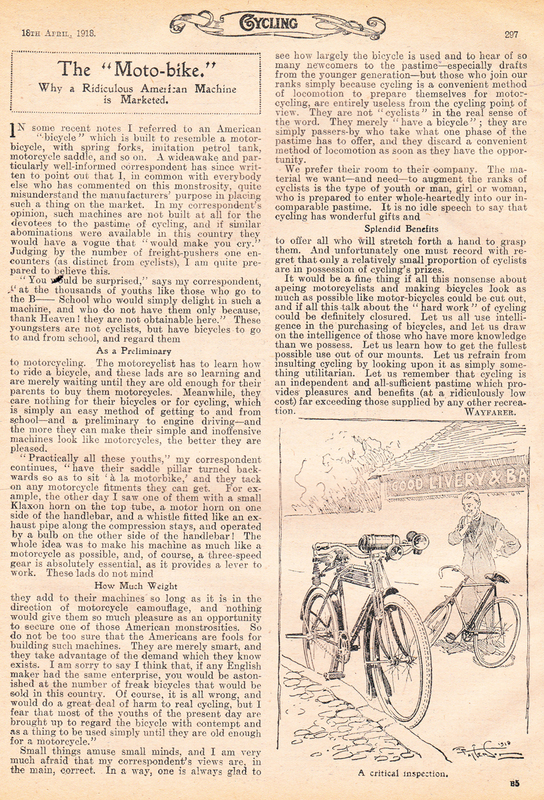 As the motorcycle industry established itself, bicycle sales suffered, and the bicycle manufacturers now had to aim their products at young teenagers. 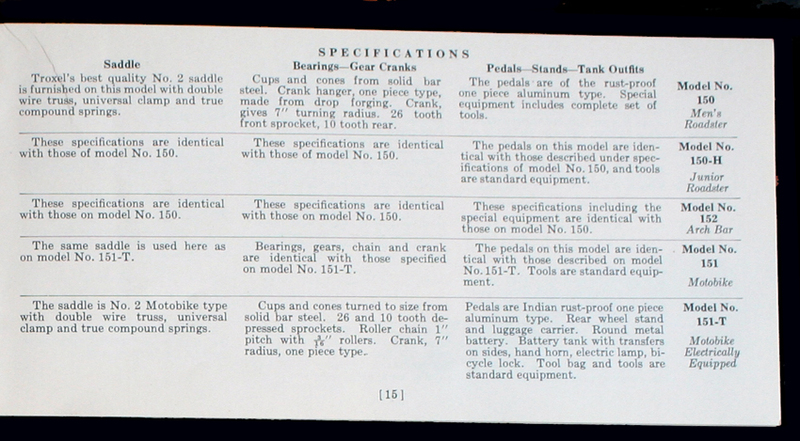 Hendee Manufacturing Company, makers of Indian, designed a range of bicycles that looked like motorcycles. Now younger brothers could ride an Indian too! For kids around the world, promotional images of that time illustrated the ultimate in personal transportation. They could only dream of sitting in that saddle. 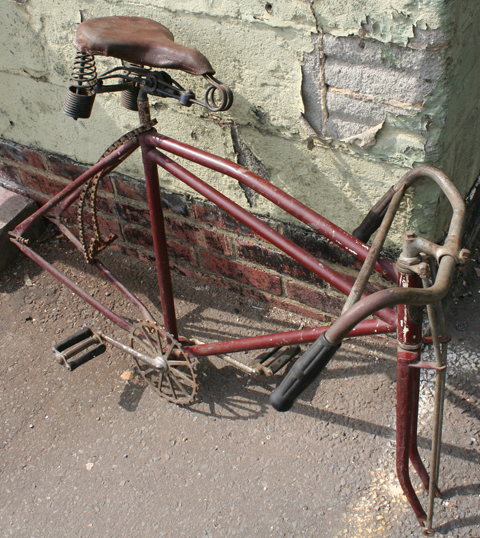 Welcome to my ‘dream’ bicycle. 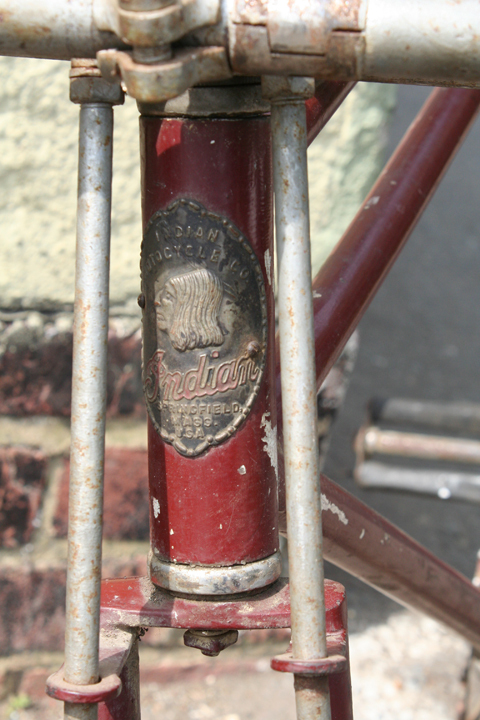 A 1920s Indian ‘Motobike’ is not an easy bicycle to find. On the odd occasion you do spot them for sale, they’re invariably expensive and (even worse) they’ve had one of those atrocious American shiny restorations. So when I found this project bike I snapped it up. I spent most of 2010 finding parts to build it. Here are photos of its progress. Above, you can see the bike when it arrived, in January 2010. First the paint was rubbed back to original. Though it had been over-painted sometime during its life, the artist had used household paint, so it was possible to remove it. 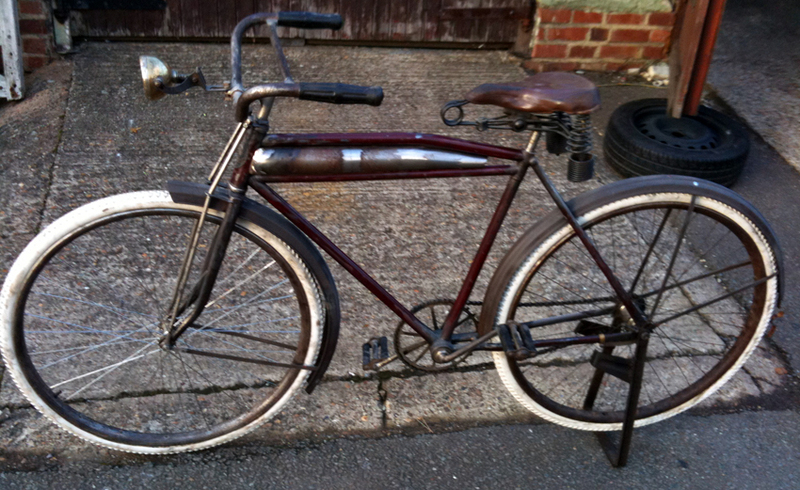 In the photo below it now sports (very expensive) white solid tyres; I bought them from Memory Lane three years ago, but didn’t have an ‘exclusive’ enough wood-wheel bike to put them on. 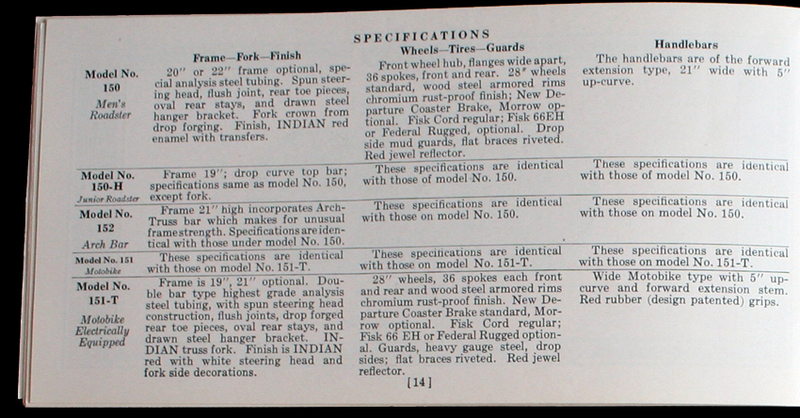 This difficulty in fitting tubular tyres to the wooden wheels of pre-1932 American bicycles is the reason I prefer to replace them with British steel wheels (though period British wheels with coaster hub are also a challenge to locate). The tank will now be resprayed, then rubbed back to blend in with the rest of the bike. Finally, the ‘Indian’ logo will be applied by hand onto the tank. 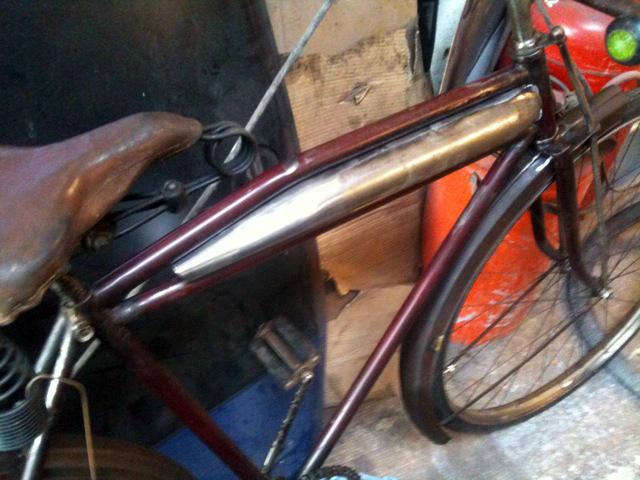 The tank has now been painted, and then dulled to match the bike’s patina. Now only the logo to apply. Compare this 1920 Indian Ladies Roadster Model 154. While the men’s bike is the heavy-duty ‘motobike’ style popular in the twenties, the ladies model harks back to the designs of the 1890s. These Indians make a nice pair because, until 1924, the company was called Hendee Mfg Co. So the headbadges are different. 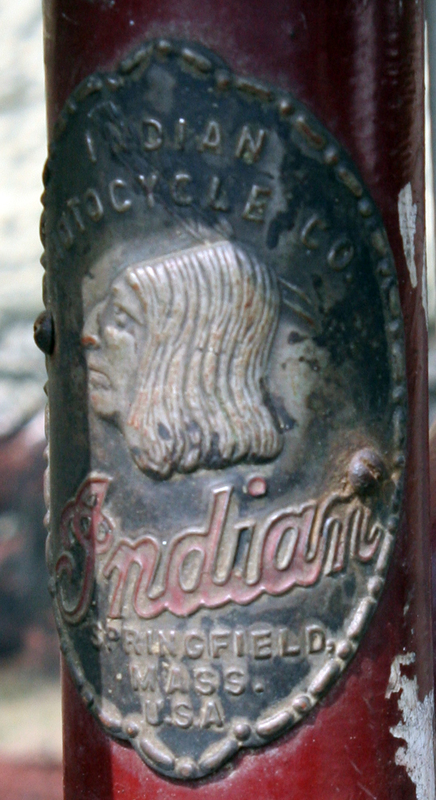 Compare the badge on the Hendee Indian above, with the 1924 Indian Motocycle Co headbadge below.